TRADE-IN: Any competitor’s MANUAL CLEAN Drawer-In-Housing & IMI will pay for the freight to ship unit to IMI and user will receive an IMI RARE EARTH SELF-CLEAN Drawer-In-Housing of same size (or larger) for the IMI RARE EARTH SELF-CLEAN Drawer-In-Housing List Price MINUS the amount user paid for their original unit with valid invoice or proof of payment price. UPGRADE: Any IMI MANUAL CLEAN Drawer-In-Housing & receive an IMI RARE EARTH SELF-CLEAN Drawer-In-Housing of same size (or larger) for the IMI RARE EARTH SELF-CLEAN Drawer-In-Housing List Price MINUS the amount customer paid for the IMI MANUAL CLEAN Drawer unit. PLUS, Customer can keep their original IMI unit. TRADE-IN: Any competitor’s CERAMIC Bullet or EP Tube equivalent & IMI will pay for the freight to ship the unit to IMI and user will receive an IMI RARE EARTH PHL EZ-CLEAN unit of same line size (or larger) for RARE EARTH PHL EZ-CLEAN List Price MINUS the amount user paid for their original unit with valid invoice or proof of payment price. 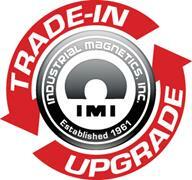 UPGRADE: Any IMI CERAMIC Bullet or EP Tube, & receive an IMI RARE EARTH PLH EZ-CLEAN unit of same line size (or larger) for the RARE EARTH PLH EZ-CLEAN List Price MINUS the amount customer paid for the IMI CERAMIC Bullet or EP Tube unit. PLUS, Customer can keep their original IMI unit. EXAMPLE: User has a 12” X 12” Ceramic Manual Clean from Competitor ‘A’ which they purchased in 1999 for $1600; IMI equivalent is an IMH1212R2SC which sells for $8524. Net price for IMH1212R2SC after RETURN of Competitor ‘A’ magnet: $6924 ($8524 - $1600 = $6924).